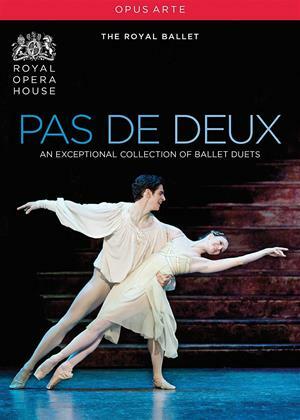 This unique collection celebrates the pas de deux: the steps for two or partner dances so central to ballets both modern and classical. It brings together 16 exceptional pas de deux from The Royal Ballets unequalled repertory, in outstanding performances by Company dancers past and present. Representing The Royal Ballets heritage works and recent creations, as well as 19th-century classics, Pas de Deux demonstrates the choreographic diversity, technical brilliance, show-stopping spectacle and artistry for which The Royal Ballet is acclaimed around the world. Included in this collection are Frederick Ashtons Voices of Spring and pas de deux from his La Fille mal gardée; from Kenneth MacMillans Romeo and Juliet, Concerto, Elite Syncopations, Manon and Mayerling; from Wayne McGregors Limen; from Christopher Wheeldons Alices Adventures in Wonderland and The Winters Tale; and from the 19th-century classics Giselle, Don Quixote, Swan Lake and The Nutcracker. All captured in high definition and recorded in true surround sound.